Thames Film was the first William Raban film I saw. It was a teenage viewing: the film’s thematic richness – its social, political and historical complexity – passed me by, but distinct feelings lingered. Thames Film spooked me. Blurs on old photographs, staccato photos that contrast with the moving images’ flow of life, revealed the ghosts of wondering river-side souls. Vibrant archival scenes of commerce – carefully deployed nostalgia – cut with crumbling industry evoked powerful sensations of absence. Everything felt strange: amid the primeval din of unknown industries and the river’s arcane flow, the human diminished. All presided over by Bruegel’s nightmarish The Triumph of Death. It is a film that urges repeat viewing, not only to appreciate the layered relations between image, sound and spoken word, but because one of its principle themes, which it entirely embodies, is magnitudes of time. 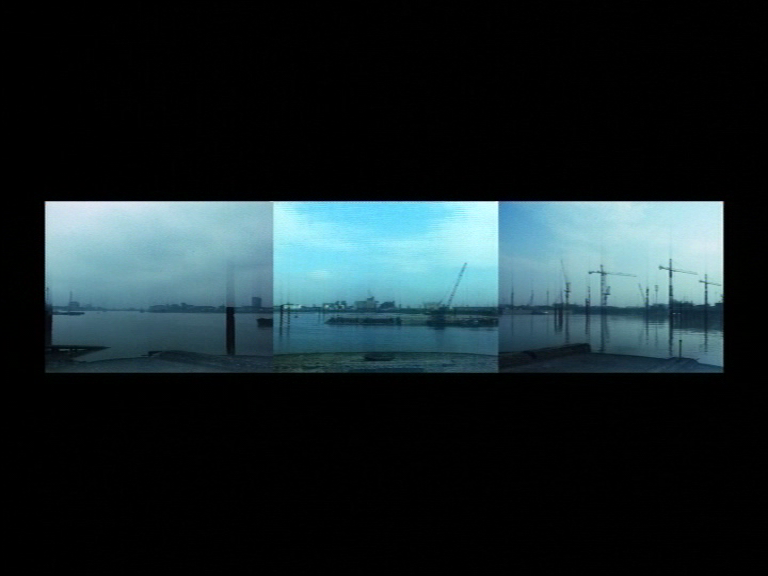 Thames Film was made more than two decades into Raban’s career, which had included structural landscape film, expanded cinema and installation. Later he would make From 60 Degrees North for television. From 1972-6 Raban ran the London Filmmakers Co-operative workshop. His pioneering films of the ‘70s developed in a climate of intense experimentation and debate about the materiality of film itself. Thames Film incorporates elements of this debate into the single-screen poetic documentary. Movement never ceases in Thames Film. Much is shot looking from the perspective of the river, from a boat that we hear but do not see. The movement of the boat – entirely contingent upon the river – determines the movement of the camera. When I interviewed Raban over email last year I began by asking about what it was that attracted him to this ‘phantom ride’ technique. William Raban: I like your term ‘phantom ride’. In fact there is one shot in Thames Film when filming with the sun behind me you can see the projection of the boat’s mast onto the banks of the river. In Thames Film I wanted to film from the point of view of the river and so filming from a small boat drifting on the tide seemed the obvious way to do it. I also had to make a decision about which side of the boat to film from. This needed to be consistent all the way through the film and I decided to film from starboard for two reasons. The rule of the sea demand that boats on the river pass each other port to port and small boats have to keep to the ‘the right’ which put the nearest bank of the river on the starboard side of the boat. The second reason was that I liked the idea of the scanning direction going from right to left which is the opposite direction to the way we read. It was almost a deliberate anti-literary tactic allowing for the fact that I wanted the audience to ‘read’ the film visually and not literally. JPW: You seem to be drawn to the sea, ports, and rivers. What fascination do these hold for you? Often in your films we arrive at the sea (the edge) from London (the centre). WR: I love filming the sea and going back to Thames Film I liked the idea that with the camera fixed to the boat, the best way to control panning movements was by steering the boat. Quite literally, filming from a boat on the water creates the perfect ‘fluid head’. Perhaps the film that most develops the idea of filming from boats is From 60 Degrees North 1991, Commissioned by Channel 4, it tells the story of what happened to the Spanish survivors of the 1588 Armada and their grueling journeys back to Spain. Filming the sea presents a particular cinematographic challenge and in my opinion there are not very many films that do this successfully. The Cruel Sea is one good example. I have owned a boat from 1982 – 2011 and I have always looked on the boat as a portable studio and adapted it to make it easy to film from. London is where it is because of its proximity to the sea and from the late 18 up to the turn of the 20 century it was regarded as “the greatest waterway in the word’’ which in terms of the trade it carried, it undeniably was. Ports are fascinating because they are usually great cosmopolitan places. They are places of arrival and departure: always in flux. The sea and navigating on the sea has always fascinated me partly because the sea might be regarded as the last great wilderness. Making passage in a boat, the bow wave closes up behind you leaving no trace of you having been there. On the land it is different because over time, our collective traces form visible tracks and footpaths. To some extent, my fascination for being on the sea has lessened. Before the days of GPS it was really exciting making the voyage from England across the Bay of Biscay to Spain. It is about 500 miles. Once the shore drops out of sight astern, you are never quite sure of exactly where you are. I navigate by dead reckoning and plot the hourly position on the chart though spurious currents and leeway can mean that over many hours I may in fact be somewhere different from where I think I am. Closing the coast at the end of the voyage is always exciting because I have to reconcile the features in the landscape with the detail on the chart and there are additional clues offered up by the depth contours on the sea bottom. People have navigated this way for millennia. Now GPS means that a navigator knows exactly where they are at any time on the voyage and for me, this has taken a lot of the ‘magic’ of passage-making. The other thing that has changed in the last 20 years is the increased pollution of the sea. Even 300 miles offshore I meet with floating bits of plastic, bottles, fishermen’s debris and all kinds of flotsam. JPW: It seems an abiding interest for you is in encouraging an active viewer. In early work this was by making self-reflexive film, where the means of production is an essential part of the viewing experience. How is this played out in your films after the mid-80s which use a more conventional single view-point perspective and less the performance of presenting film familiar to expanded cinema? How do formalist concerns persist in your work today? WR: Expanded cinema is only one means of pursuing active spectatorship. Incidentally, I don’t like ‘self-reflexive’ because it is a tautology (‘self’ is present already in the term reflexive). I think that having started out making films that might be broadly defined as structural, this informs all subsequent practice. Certainly it is evident in About Now MMX (2010). I have only made one television commission (From 60 Degrees North) and having made it, I decided that wasn’t the way I wanted to go. Channel 4 bought and showed Thames Film and I have made 3 other joint commissions with a broadcaster and The Arts Council. JPW: I suppose this leads on to another question about preferred places for your films to be seen – as installation in a gallery or theatre? WR: I much prefer to show my work in cinemas for two reasons. First, they are designed for showing films so the audience experience is generally much better than showing film in improvised spaces. Secondly, I think that there is a transgressive dimension to my work. Art gallery audiences tend to expect to be shocked by work on show in galleries, whereas cinema audiences (for the most part) expect to be entertained. When I show my work in a film theatre, I think the audience are able to reflect upon the inherent conservatism of cinema as an institution and thus it brings out the transgressive aspect in my films. On the other hand, the question of where to show work is largely a pragmatic one and invariably I do a lot of shows in galleries and museums. I have a couple of works on show at the Helsinki Photo Biennial and they have done a great job in showing the work HD on a large screen in a properly blacked out space. I am also showing The Houseless Shadow in a mini-cinema within the Dickens and London exhibition at the Museum of London. This has also worked out well but it means that the sound on my film creates the soundtrack for the whole exhibition (as noted by several reviewers) because it spills out from the viewing space. JPW: For many years sound recordist David Cunningham has designed sound for your films. Sound in your films has a remarkable degree of intention and autonomy. How would you describe your attitude to sound? WR: Of course films can be silent as some of my early films are but I do like to work with sound. Richard Guy did the sound for Thames Film and Alan Lawrence did the sound for Sundial and A13. I usually do the original sound recordings myself and it is the sound post-production where the main collaboration takes place. I have worked with David Cunningham since he did the sound for Island Race (1996) and again, I usually make most of the initial sound recordings which David then develops into finished sound scores for the films. I rarely work with sync sound. I like to get my shots mute so I can focus entirely on the picture and then if I need sound from the location I will record it either before or after getting the shot. That way I can give my full attention to the sound. I think that the soundtrack has the potential to both work with and against the picture. I see it as having 2 tracks (picture and sound) in parallel and quite often I like to play with the idea of the soundtrack doing something quite different to picture. Chris Marker does this very successfully in Level Five. In general I work in an anti-illustrative way so I don’t necessarily want spot effects in the film. Also, I quite like to let the sound cross the picture cuts. JPW: How do you reconcile beauty and politics? What I mean by this is a tendency in the tradition of the picturesque to occlude politics, issues of land ownership, for example. WR: I am thinking about this at the moment. I am starting to think that I am not really interested in aesthetics and never have been. The way my films look seems to be determined more by the necessities and conditions of their construction rather than by going out of my way to make beautiful images. I am starting to think that this has more to do with ethics than aesthetics – almost in the way that Aristotle uses the term ‘kalon’ which includes ethical dimensions within aesthetic understanding. I wonder, whether in future, people might look back on process-based art of the 70s (of which structural film forms a part) and see this as an attempt to recover the original meaning of ethics that used to pertain to aesthetics? I need to think about this because it is not entirely clear to me. When I make a new work, the thing I find myself striving for is to make an object of both truth and beauty. But of course truth is beauty so maybe the sole object should be to make an object of truth? The notion of the ‘picturesque’ suggests landscape to me, especially when you consider ‘issues of land ownership’. I see many of my films as ‘political’ but this acknowledges the pertinent observation by Jean-Luc Godard ‘The problem is not to make political films, but to make films politically.’ I digress from landscape. I used to be irritated by the generic term ‘landscape film’. I was suspicious of where people were coming from who used it. Given that there is an accepted tradition of English landscape painting, I thought it was an attempt to legitimate film as a fine art practice. Partly with that in mind, I started making urban landscape films with Moonshine (1975) and Autumn Scenes (1978) and of course, it includes my more recent London films as well. I have always seen LS Lowry’s paintings of the industrial northeast as landscape paintings and I think there is work to be done to reclaim the term ‘landscape’ to include the city as well as so-called natural landscapes. JPW: I would like to ask you about ideas of Englishness in your work. You play with particular motifs, even cliches, for example, in Continental Drift we see the white cliffs of Dover. Some of your films take us to France, which seems a conscious attempt to raise the question of Britain’s island identity and relationship to the continent. The BNP in Island Race. Whenever I see or hear the white cliffs of Dover I cannot but help think of the second generation British Indian poet Daljit Nagra’s Look We Have Coming to Dover! which usefully corrupts this English motif. What does Englishness mean to you? What is it to be an English subject? WR: I am fascinated by the idea of Englishness. England has radically changed since I was a child in the 1950s. I was thinking about this when I made Island Race and reading demographic projections. I was struck by one prediction that intimated that by 2030, the dominant faith in the UK would be muslim. 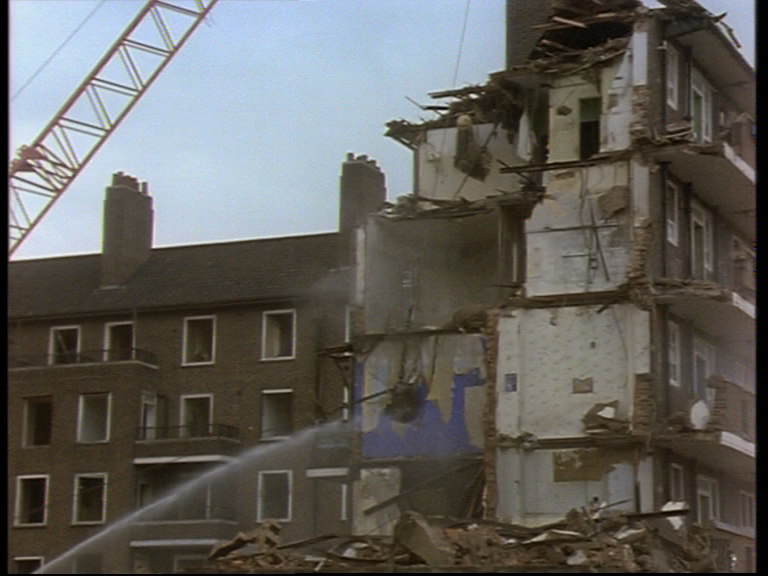 Obviously, Englishness is an idea that is constantly changing and one of the motivations behind making Island Race was to see whether the microcosmic view of life on the streets of Tower Hamlets would offer up any clues as to a wider sense of English national identity in the late 90s. Who had lived part of their lives through the Victorian period so maybe that was why it was distasteful to me? There is an irony that my latest film The Houseless Shadow is based on The Night Walks essay by Charles Dickens! Perhaps that is because there is now sufficient distance – there are now no survivors born of the Victorian age. I relish the fact that England has now become a multicultural country. I certainly have no regrets or sense of loss about the changing face of England. 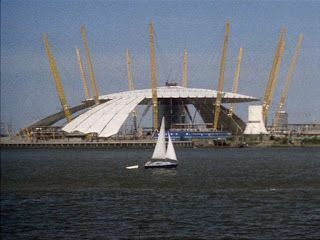 JPW: Although ostensibly about the Millennium Dome, your film MM develops into a terrifying surrealist sci-fi that culminates in London being destroyed. This narrative is achieved with sound and moving image. How do you use metaphor? I found Thames Film similarly terrifying. 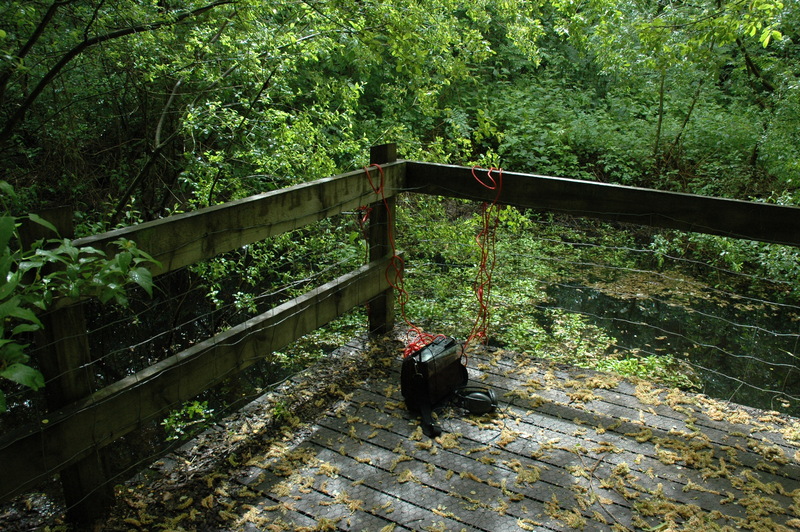 The scale of things, the other-worldliness of sound – the river is a repository of dead bodies, old memories and loss. Perhaps this is the sublime? Or something occultish? WR: I love that description “MM develops into a terrifying surrealist sci-fi that culminates in London being destroyed.” That is what I wanted to portray but I didn’t realize it was obvious. I think metaphor is dangerous but I guess I do use it, or if not metaphor, at least symbolic imagery. I think that the Canary Wharf Tower has this quality in the Under the Tower trilogy, as does the dome in MM. I am glad you had the same feeling in Thames Film. There I think it is Brueghel’s Triumph of Death painting which is a recurring motif. I don’t find the painting morbid because it has a deep sense of humour concerned with the futility of fighting death. Chaucer’s The Pardoner’s Tale does something similar and in a modern context I found the declaration of the War on Terror by Bush Blair and Aznar to be doing exactly the same. It is difficult to comment but I suspect this has more to do with the sublime than the occult. JPW: Do you consider yourself an artist filmmaker or feature filmmaker? Is it a useful distinction? WR: Like the whole business of genre, these terms are slippery. I hate being referred to as ‘avant-garde’ because that refers to artistic practice in the 1920s and shouldn’t (in my view) be used as a contemporary description. Experimental is difficult too, because there are mainstream filmmakers like Kubrick who could justifiably be called experimental. Artist filmmaker is the least problematic. When I started with the London Filmmakers Co-op none of us called ourselves ‘artists’ filmmakers was the term we used. Feature filmmaker implies making films longer than 60 minutes and since I have only made two of those Black and Silver (1981) and Thames Film (1986)) it doesn’t describe my practice. In answer to your question, I think we need to come up with a new term. ‘Independent filmmaker’ worked in the 1970s but ‘cultural filmmaker’ (2000) sounds a little pretentious. JPW: Who influences your work – be it other filmmakers, visual art or literature? WR: In terms of film, I really admire Dziga Vertov, Kubrick, Godard, Michael Snow and Roy Andersson. Visual Art – of the English artists, Mark Boyle and John Latham are up there with the greats; Mark Rothko and Morris Louis are supreme champions in America. Literature is a bit more difficult, but I would say Conrad, TS Eliot, and maybe Dickens. (though I am a late convert). JPW: You have used film consistently throughout your career. Have you used video? Is it possible that different camera equipment puts you at degrees of proximity or distance to the landscape? WR: It is fair to say that all my work up to now has been on film – either 16 or 35. The Houseless Shadow is my first all digital production though I have occasionally used video for documentation purposes. It seems silly to mourn the passing of film. Now that the film labs have closed down it has become virtually impossible to work analogue now. I love the slow working speed of film and the way in which because it so expensive, it makes me deliberate on what shots to get and how long to hold each one for. I love cutting on a Steenbeck because it is slow. Cutting 3 or 4 shots a day into a film is good going. Working digitally with Final Cut Pro it is almost too fast. I like to work with a material that is close to my thinking speed and film feels right for that. Having just worked with digital it does have obvious advantages. It was brilliant for shooting low available light in nightime London. It is obviously much cheaper than film. The results are pretty much immediate but then I liked the whole process of the latent image that had to go to a lab to get developed and printed. Realistically, it is doubtful I will have another opportunity to make a film so digital definitely seems the way to go. To answer your question, I guess that because the camera is lighter, smaller and quieter, digital is less intrusive and thus allows me to get closer to my subject. On the loss side, I don’t have the same choice of lenses. I always liked to shoot with prime lenses which meant that before going out, I would have to consider the perspective of the shot. With digital, I use a zoom lens and though I don’t zoom in the shooting, I use it as a variable focal length lens. On Wednesday 24th July Writer Jonathan P. Watts presented the following text to introduce the first of the Duke’s Wood Project film series at Nottingham Contemporary. The three films were followed by a conversation between Emily Richardson and writer Jonathan P. Watts (Ordinary Culture). When Ordinary Culture invited me to put together a programme of moving image works, around six months ago, I was reading a book by the writer Harriet Atkinson on The Festival of Britain called The Festival of Britain: A Land And Its People. In 1951, the Festival of Britain gathered the best in modern architecture, art and design on the Southbank, London in a concerted effort to reconstruct a nation displaced and truamatised by the Second World War. It offered those who attended a good time, but also a sense of an ending and a beginning – a vision of how a future Britain as a model democracy could be made. At the Festival of Britain was an exhibition pavilion called Origins of the Land. Its entrance was designed to look like a cave – passing the threshold was to travel backwards through time into an underground mineral realm. 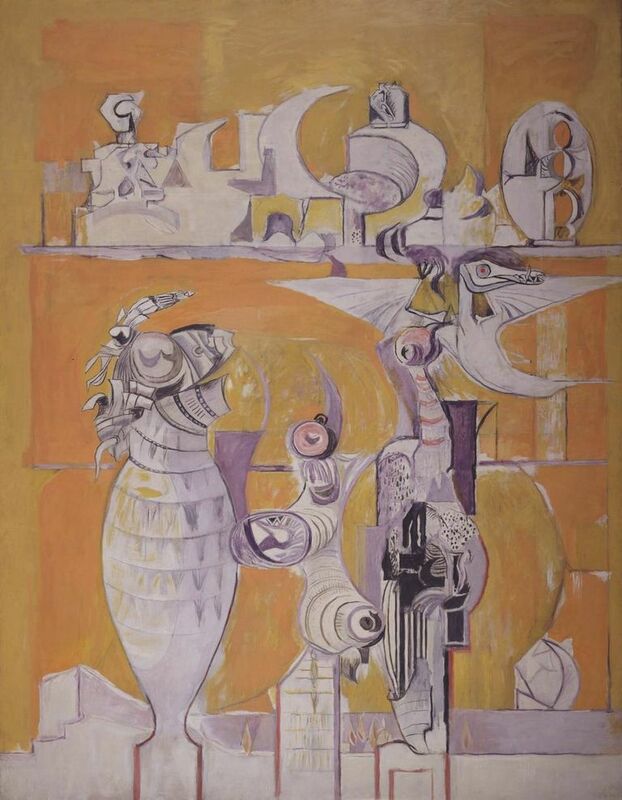 Greeting the viewer was Graham Sutherland’s oil mural The Origins of the Land (1950-1). This painting represents primeval Britain – sea life and pterodactyls – as abstracted shapes. Accompanying this were animations recounting the 70 million year story of Britain’s geological formation. At the centre of the pavilion was a column of artificial rock concealing a 16mm projector showing films on a loop which projected onto a map. Titles included Fossils Which Come to Life, Land Fauna and Reptiles, Earth in Labour and Landscape Scenes. An accompanying pavilion called Minerals of the Island displayed an exhibition of coal-mining methods from prehistoric times to the present. It showed how developing mining technology pierced through the stratified layers of earth, rock and minerals in ever more effective ways. For Fossil Culture I fantasied about fabricating a column of rock, concealing a projector inside it and showing the Festival of Britain films in their original, unconventional way. Fantasies aside, the Festival of Britain and this period of history seemed an appropriate way to frame Fossil Culture for a few reasons. In these pavilions nationhood were tied to mineral wealth and production. Inherent in this was an extremely poignant paradox: while national identity was tied to Britain’s geological foundations of landscape – what could be more solid – this foundation was being pierced, extracted and destroyed for the creation of wealth by increasingly sophisticated technology. Paradoxically, what sustained national identity, while promoting growth, also, potentially, contained the seeds of its destruction. Today nationalism has a chequered reputation. But landscape, particularly rural landscape, continues to be evoked as what is at stake with environmentally destructive extraction of fossil fuels – take, for instance, fracking, the practice of drilling into rock to release gas and oil from shale rock. But this programme is not just about oil. The umbrella term fossil fuels includes coal. Fossil Culture, the title of this programme, has an intended double meaning. According to Raymond Williams the Latin root of culture, colere, means to inhabit, cultivate, protect, honour with worship. On the one hand I want to evoke the non-human formation of fossil fuels by organisms deposited millions of years ago. And on the other evoke human culture as it has been sustained by fossil fuels in a comparatively minuscule time span. Obviously much has changed in the intervening years between mid-century Britain and today. Certainly growing environmental awareness has raised consciousness about the long term consequences of burning non-renewable fuel, but before that communities cultivated around oil and particularly coal have been decimated and disenfranchised. 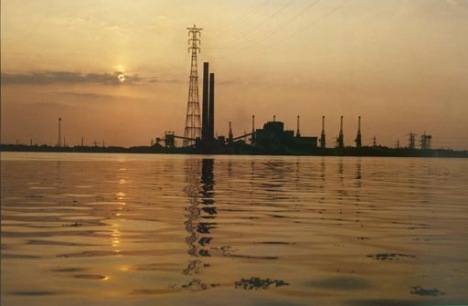 For Fossil Culture, rather than show post-war Festival of Britain films, which project a brighter future underwritten by fossil fuels, I resolved to show three contemporary takes on the situation, each with their own contemporary senses of anxiety, beguilement, ambiguity and longing. Heidi C. Morstang’s Certain Degrees Below (2007) is set off Western coast of Norway where the oil tanker Server was shipwrecked by a storm in January 2007. Three hundred and seventy tons of oil and diesel seeped into the sea and quickly spread along the coast, affecting bird reservoirs on the island of Herdla. Certain Degrees Below is an inditement, Morstang writes, not only of ecological vulnerability, but of those who are responsible. Mikhail Karikis and Uriel Orlow’s film Sounds from Beneath (2010-11) is structured around a choral piece performed by the Snowdown Colliery Male Voice Choir. The men, in collaboration with Karikis, devised the piece entirely of remembered subterranean sounds of a working coal mine. Subsequently, Karikis invited the artist Uriel Orlow to collaborate on the moving image work, which depicts the choir performing the piece – underground explosions, alarms and pickaxing – on a closed colliery in the South East of England. Emily Richardson’s film Petrolia (2005) takes its name from a redundant oil drilling platform in the Cromarty Firth, Scotland. Using time lapse and long exposure techniques, she explores the sublime, strangely autonomous architecture of an industry faced with obsolescence – Scottish oil and gas supplies are predicted to run dry in the next forty years. 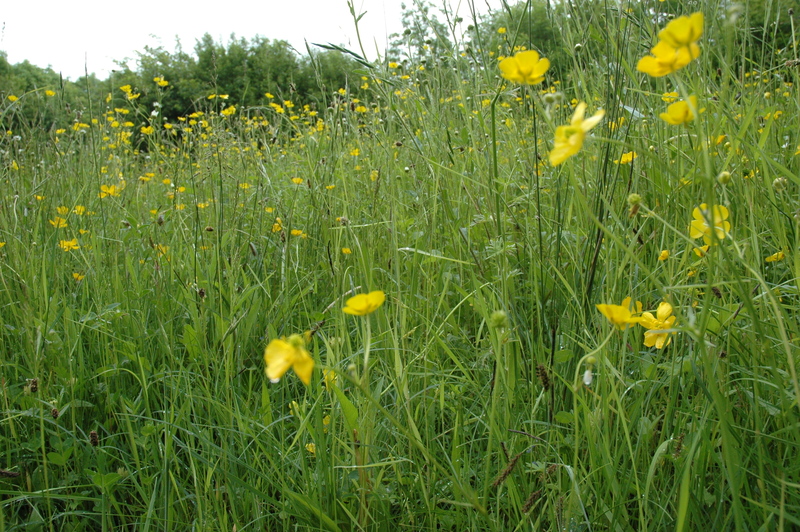 It was extraordinary to me how much ground cover had grown up in the last few weeks. 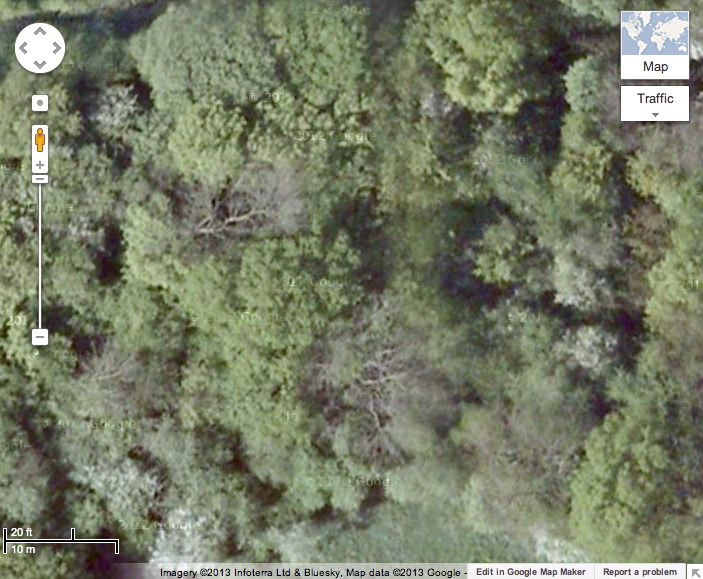 In places, the Wood is unrecognisable as smaller discrete ‘landmarks’ are obscured. Though hardly large, it is still surprisingly easy to lose bearings. The main task has required treading a now familiar track in order to open the remaining uncapped well. This has become Herculean – it has resisted opening on several occasions, but this has now been achieved to all intents and purposes (with the gallant help of Kevin and John from the Duke’s Wood Oil Museum). The exact location can’t be disclosed but it is somewhere on the ground beneath the canopy visible in this Google Maps screen grab (below). During an opportune conversation with some folks from the Nottinghamshire Wildlife Trust (camped outside the Museum to have their sandwiches one lunchtime), I met Michael Walker (Living Landscape Monitoring Officer) who opened up the possibility of listening in to bat sounds at Duke’s. He subsequently sent an email with example files of the surprisingly melodic calls of pipistrelles (they ‘sing’ in summer apparently – with 3 or 5 notes in a trill). He explained the differences in bat detection devices – my simple heterodyne ‘batbox’ in relation to his more sophisticated device that works on the principle of time expansion – recording all frequencies simultaneously. I look forward to an imminent walk after sunset to record these enigmatic mammals – to listen to what ordinarily can’t be heard. Walking along the track up to the Museum, I stop to look into a man-made pond. 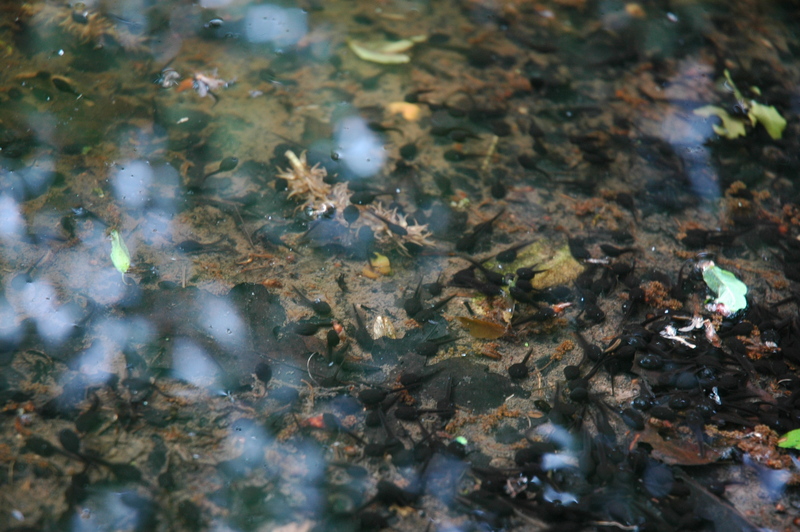 Looking closer, it is teeming with tadpoles (Sam later told me his father witnessed the cacophonous mating frenzy weeks earlier). I put some hydrophones down into the water to record their activity (both my professional Dolphinear hydrophones and later, a rough and ready homemade contact mic). It is an entrancing audible world to listen in to: a beautiful, humorous sound of manic and rhythmic scratchings. I have been back since – to see how much the passing of time (just a few weeks) and the increased growth of these creatures (I spotted one juvenile frog) might affect this sound. The year moves on. (1) From The Secret of Sherwood Forest: Oil Production in England During World War II by Guy H. Woodward and Grace Steel Woodward (1973).